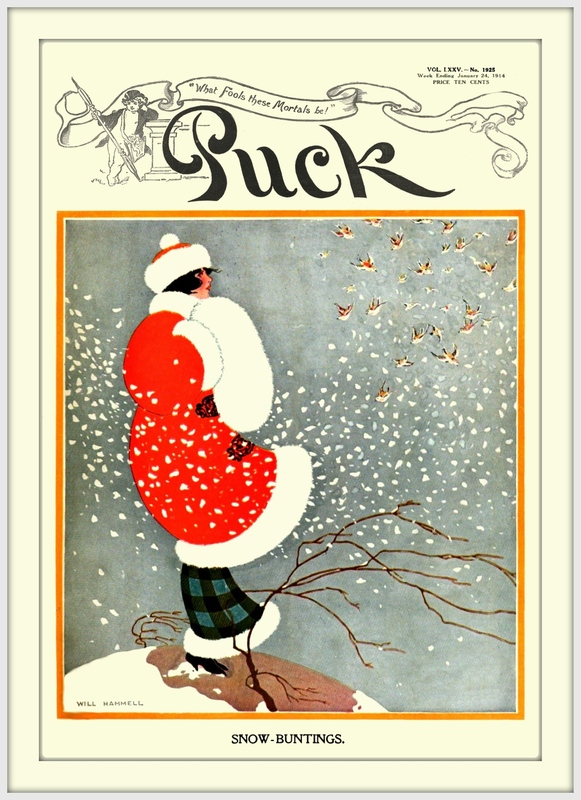 Wonderful cover illustration from the January 1914 edition of Puck magazine. The artist was Will Hammel. Hammell was an American artist born in 1888. He shared an art studio with his wife Elizabeth. While his death in 1963 means that much of his work remains under copyright, these early works that were published prior to 1923 are in the public domain under American copyright law. In this cover art illustration entitled Snow Bunting, we have a young woman all bundled up for a walk on a snowy day. Looking a bit like Mrs. Claus in her red coat with snow-white bunting, she appears to have charmed a small flock of birds who fly nearby. Her green and plaid skirt is even trimmed in the white fluffy bunting. I’m thinking the illustration is taken from what was originally a watercolor and pen and ink mixed media painting. If you would like a larger version of this lovely lady in her winter finery, simply click on the image above.